Break out the barbecue for these tasty Thai Satays. 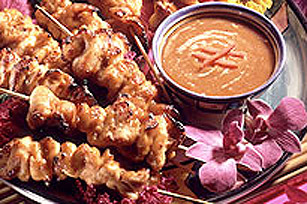 Marinated in a quick Thai-inspired peanut sauce, these grilled chicken satays make a party-perfect appetizer or entrée. Heat barbecue on medium-high heat. Mix peanut butter, barbecue sauce and soy sauce. Reserve half to use as a dipping sauce. Thread chicken, in ribbon fashion, onto wooden skewers; brush with half of the remaining barbecue sauce mixture. Grill 5 to 7 min. or until chicken is done, turning and brushing occasionally with remaining barbecue sauce mixture. Serve with reserved sauce. Add 1/2 tsp. crushed red pepper to barbecue sauce mixture before using as directed.